If you’re a fan our Hot Deals for Cold Days promotion, then you more likely know Patti Grauel as “Patti The Buyer.” She’s the person who finds the best deals from our bicycle accessory and clothing manufacturers, then passes them on to you. It’s a talent she’s honed during an entire career devoted to being a buyer. 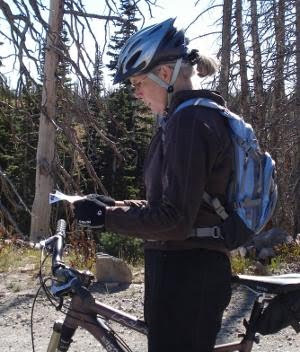 Prior to joining Century Cycles six years ago, Patti was a buyer for the Wilderness Shop in Lakewood. She now does all of the accessory and clothing buying for all three Century Cycles stores out of our Peninula location and lives nearby, just west of Akron. A: I have four right now – a mountain bike, a cyclocross bike, and two road bikes. A: I do. It’s hard to pick a favorite, but I’m most passionate about mountain biking and I really like my mountain bike, a Raleigh XXIX+G. Q: In September, you attended Interbike, the big bicycle industry trade show in Las Vegas. What were your impressions? A: Big picture, the bike industry is doing pretty well despite the economy. Everyone was pretty optimistic and upbeat, which it usually tends to be because the bike industry is so much fun! There were a lot of great new products. Q: What trends did you notice? A: The commuter trend is still going strong. The road bikes also looked great, with a lot of different price points and choices. There are a tremendous amount of really fun things, like Electra’s new accessories, SRAM's new components, and new lights from Blackburn and Nightrider. Pearl Izumi has changed their entire shoe line for spring and we’re one of the first stores to have them. I think the new line-up is going to be very strong. Women’s-specific clothing and bike selection continues to expand and grow. The manufacturers are responding and recognizing that women are a huge part of the bicycle business. They are no longer simply making smaller/scaled down sizes, but are designing products and components that really fit women and therefore increase their enjoyment on a bicycle. Q: What’s your favorite trail or ride? A: In Ohio, it’s Mohican State Park. Anywhere else in the U.S., it’s probably the trails in the Moab area. I’m really lucky that I’ve been able to spend so much time out west, usually traveling for work, and there are so many great trails that I've had the opportunity to ride. Q: What do you enjoy about working at Century Cycles? A: It’s great working with everyone at the Peninsula store. I was a Century Cycles customer when I lived in Lakewood, so it’s been a great opportunity for me to work for a company I shopped and appreciated. The bicycle industry is very fun and you can tell we all really love what we do. I never lose sight of how wonderful it is to work in the middle of a national park. My commute to work is very scenic and it is great to work where bicycling is natural part of the landscape. Q: What do you like to do when you’re not working at Century Cycles or on a bike? A: I really enjoy martial arts and am working towards earning a black belt in tae kwon do. I’m still very much into climbing, mountaineering, and hiking with my dogs. A: It was a blue Schwinn with a banana seat. Q: What three words describe how you feel on your bike? Q: What is your biggest accomplishment on a bike? A: Some of the downhill mountain bike trails outside Park City, Utah. It was challenging terrain – especially after mountain biking in Ohio – and really challenged my technical skills. Q: What was the best cycling advice you’ve been given? A: Wear your helmet, try not to fall too much, and have lots of fun. Q: What cycling advice do you give most often? A: The same -- wear your helmet, try not to fall too much, and have lots of fun! They are no longer simply making smaller/scaled down sizes, but are designing products and components that really fit women and therefore increase their enjoyment on a bicycle. Does this mean that a medium in "the real world" will no longer mean XL in the cycling world? I so look forward to that day!! Buying bicycle clothing for a woman can be totally demoralizing. Who are all these fatless women who are cycling?? !